We’ve all got a morning routine we like to follow, and for most of us that includes checking out what the weather will be like that day. 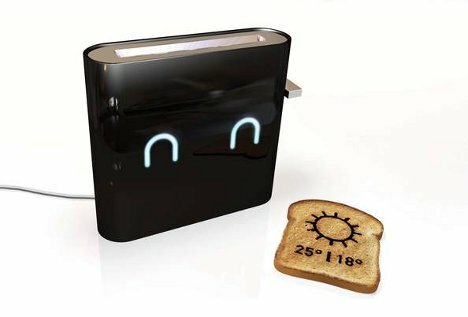 Designer Nathan Brunstein’s concept would make that routine a little more fun (and a lot more cute) by “printing” the day’s weather onto a slice of toast. 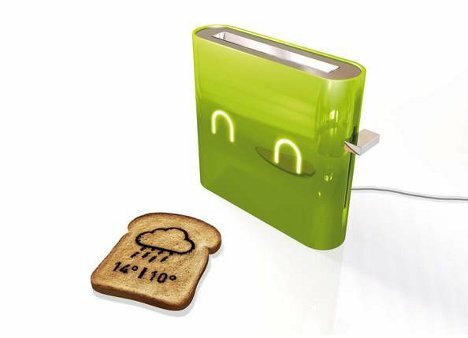 Jamy, the Smart Toaster, is wi-fi equipped to gather the weather info for you every morning. When you slip in a piece of bread and push the plunger down, the heating element toasts the entire slice but makes a slightly darker toast in the shape of a simple weather report. Along with the high and low temperatures, the toasty weather report includes a picture of the expected weather: sunny, cloudy, rainy, etc. There’s no information on whether the designer intends to manufacture the concept at this point, but we can imagine there are at least a few folks out there who wouldn’t mind some tasty weather reports in the morning. See more in Unbuilt Concepts or under Technology. October, 2012.